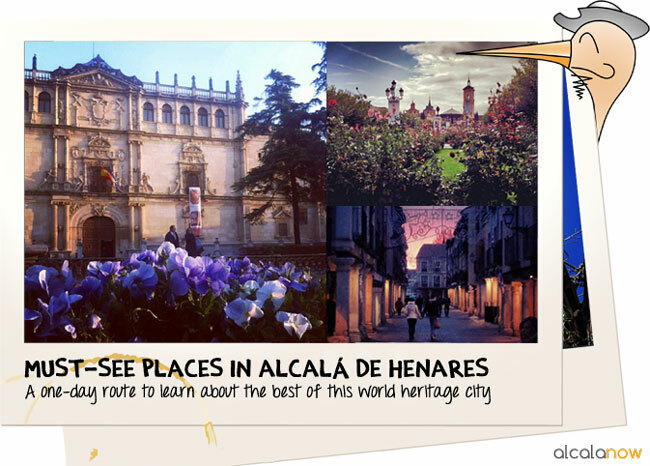 What to see in Alcala in just one day? It is not an easy task. Alcala may seem a small city, but it has huge heritage and a long history. There are plenty of beautiful places to visit, while it may be confusing to know what to visit when you are coming to Alcalá for just one day. That is why we have designed this tour, which goes over the most important buildings, charming streets and ancients quares. We inaugurate with this post our tours around Alcalá. We will propose you different themed routes to visit Alcalá. We hope you like it! The walk starts in the main college of the University and goes by inside the historical old town. These two elements have been included in the UNESCO World Heritage list. Take into account that this tour doesn’t include everything that there is to see in Alcalá. If you have more time to spend in Alcalá, you should definitively try some of the other routes that we are designing. In case you are going to show the city around to other people, you may need to remember the most important facts of the History of Alcalá. Read this post and brag in front of your friends about how much you know. Visit this link for more information about public transport in Alcalá. 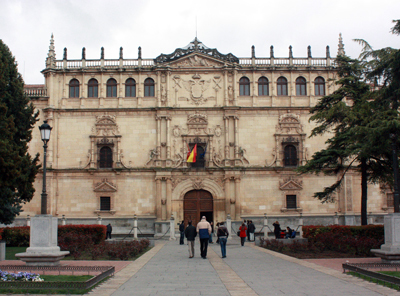 If we had to choose just one thing to visit in Alcalá, most of us would choose the University. Cardinal Cisneros founded in 1499, and since then, it has been one of the most important institutions in Alcalá. Learn more about it in this post. College of San Ildefonso is a building that is worth a visit, even though you have to pay 4 euros for a guided visit, you’ll definitively love it. The facade is gorgeous, and if you come on a weekday you can visit the patios for free. Nevertheless, the only way there is to visit Paraninfo or San Ildefonso’s Chapel is to pay for the visit. Sculpture of Cervantes, and tower of Santa María on the back. Cervantes Square is the former Market square of Alcalá, where medieval people traded their products on market days. The square was also used as a bullring during fairs and festivals. It’s name comes from Miguel de Cervantes, one of the most important icons of Alcalá. 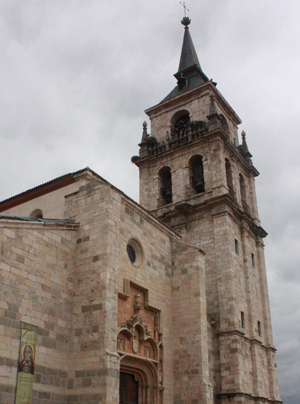 He was born in Alcalá, in the old church of Santa María, whose ruins are next to this square (Oidor Chapel and tower of Santa María). 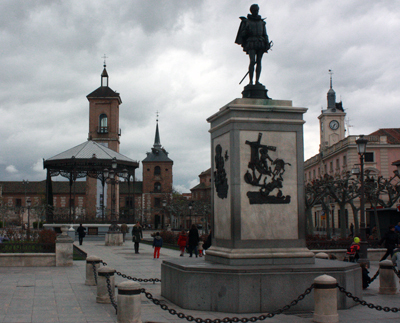 In the center of the square, there is a sculpture of Cervantes. To learn more about this adventurous writer and its relation with Alcalá, check out this link. Some extra information is always helpful. 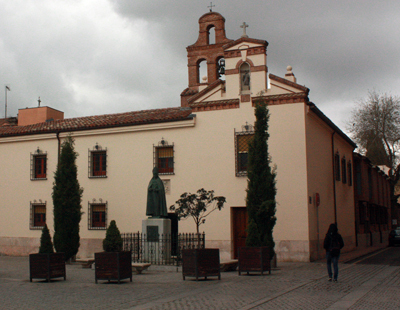 There is a Tourist Office in Cervantes Square, which is hidden in a small passage behind Oidor Chapel. Another office is placed in Santos Niños Square, where we will go later in this tour. This is an impressing building that may be unnoticed from the outside, but that will amaze you on the inside. 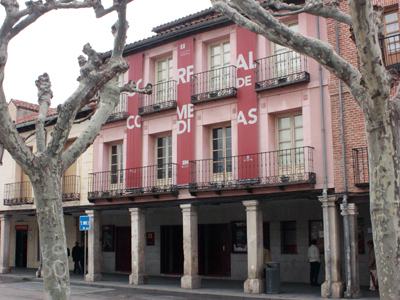 It is one of the most ancient ‘Corral de Comedias’ in Europe – an outdoor theatre set up in the inner patio of a building. It was about to be demolished, but fortunately it has been restored instead and nowadays is being used for theater, musical and ‘flamenco’ performances. Don’t missed it out! From Cervantes Square, we get to ‘Calle Mayor‘, the main street in the town center of Alcalá. In addition, it is the longest street with ‘portico’ in Spain. It is a picturesque street that was inside the Jewish neighborhood and nowadays has become the main artery of the town center. Right in the middle of Calle Mayor is Cervantes Birthplace. Its visit allows you to understand how was life like during times of Miguel de Cervantes, and it’s free! However, it is a must that you take a picture in the bench in front of this house. 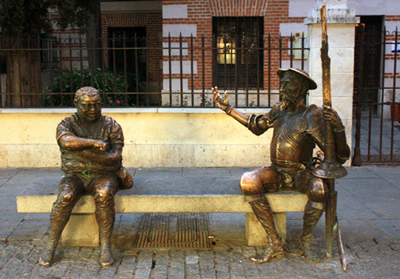 This bench has a life-size Sculpture of Sancho and Don Quijote (you should know who they are, in case you don’t click here). I guess you have been walking all morning and, by this time, you are hungry, aren’t you? This is the perfect time to have a tapa or a beer (maybe a couple) in any of the bars that are around you. This post talks about the most famous, and also our favorites, places to have a tapa. With a full stomach, it’s time to visit the place where Justo y Pastor, who are known as ‘Santos Niños‘, are said to have been killed defending Christianity. Because of that, these children were considered saints. Years later, in the place where the assassination happened, a chapel was build to keep their remains. This chapel was lately rebuilt as the existing Cathedral Magistral of Santos Niños. You may wonder why this cathedral has the title of Master, since there is only one other church in the world with this name. This is because all his canons were graduated in the Complutense University, all of them got the degree of ‘magister’. 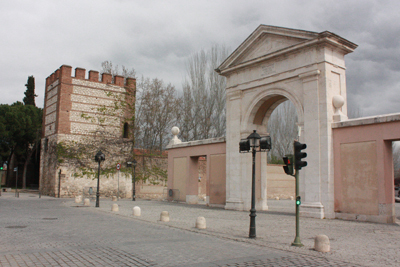 Gate of Madrid and the old wall on the back. The gate of Madrid was one of the entrance to the old city of Alcalá, in the past protected by the wall that you can see next to the gate. This is the gate people used when they came from Madrid to Alcalá. 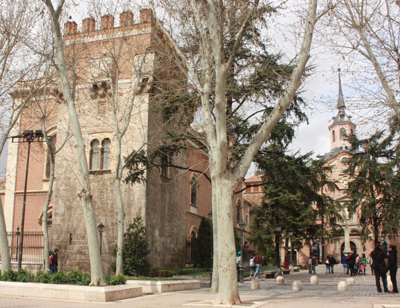 It is in front of the Gate of Alcalá (which is in Madrid, haven’t you visit it already?) In fact, both of them were connected by a road, by which you could walk straight from one gate to the other. Archbishop Palace and Convent of Bernardas on the back. Archbishops of Toledo have been living in Alcalá since 13th Century – Alcala was part of this archdiocese. The building has been repaired, damaged and restored many times, until a fire in 1939 destroyed the entire palace but one of the facades. Out of curiosity, you should know that in this very building the Queen Isabella I of Castile interviewed Christopher Columbus and decided to support and finance the 1492 voyage that led to the opening of the ‘New World’. Bernardas Square, where you are right now, is one of our favorites places in Alcalá. It is green and quiet, and is surrounded not only by the Archbishop Palace, but for the Archaeological Museum of Madrid and the Convent of Bernardas. All of them are worth a visit. Convent of Clarisas where you can buy candied almonds. What about candy to finish this beautiful tour? We suggest that you visit the convent of Clarissa nuns, which is placed in San Diego Square, where we started our visit. Here, the nuns make ‘almendras garrapiñadas’, which are candied almonds or caramel-coated almonds, that they sell. Clarissa nuns are an enclosed religious order, so that you can’t see them. Once you are in the hall of the building, place your order at the turnstile designed to let the nuns maintain their privacy. In case you are in the mood for more candy, go back to Calle Mayor where there are several ‘pastelerías’ or bakeries. Try some traditional sweets such as Costrada or Rosquillas de Alcalá. We wish this tour has been helpful to you and that you have an awesome day in Alcalá. 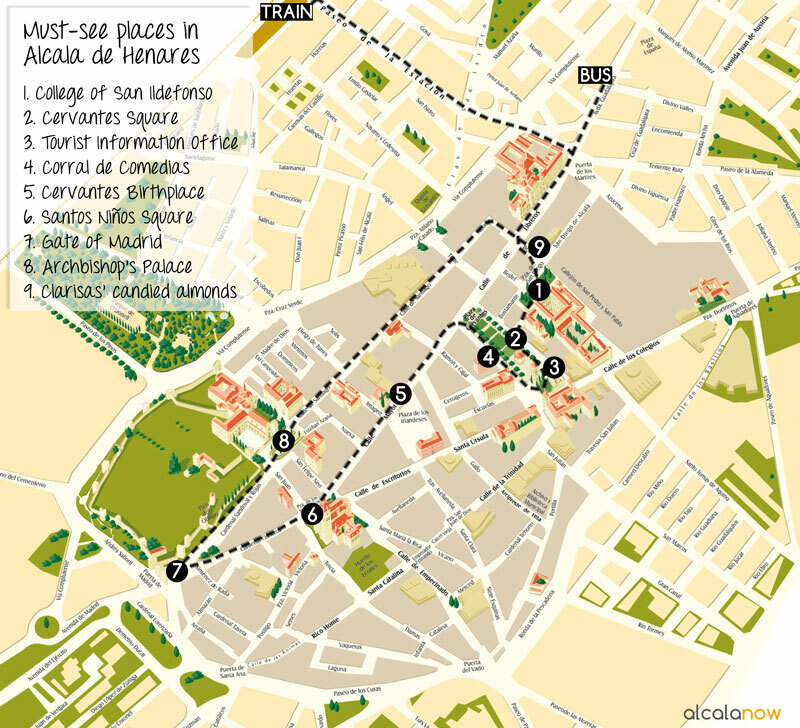 Remember that this route is a basic introduction to the main, but not every, beautiful places of Alcalá. Feel free to take a picture of any patio, public building or street that you see along your way. There are lots of lovely secret spots hidden among the streets of Alcalá, don’t miss them!! Is there a guided tour of Alcala in English? I shall be in Madrid from 28Sept to 3 Oct. They will inform you about any guided tour available in the Tourist Information Office. Gracias! He estudiado muchos años en alcala, he hecho algún tour con estudiantes internacionales… pero ahora que viene un amigo americano y yo llevo años fuera, esta pagina me ha llenado de ilusion, qué bonita es Alcalá! Esta tarde veremos todo eso y le contaré todas las cosas interesantes que esconde. Such a nice article about Alaca! I’m planning a few days trip around Madrid, and friends told me that Alaca is really close, so one day could be there… But what I dont know, what is the best way to get from the airport to madrid city centre? I don’t want to lose much time of travelling and getting lost… How are the taxis? And the transfers? I found this company: transfer2airports http://transfers2airports.com/madrid-airport do you know anything about them? Is the public transport easy enough? Thank you a lot! Hola! I would like to get in Palacio Laredo and look at the amazing design inside However, I am told it is closed. How can I get inside? Do I have have to join a local tour? I am going to Alcala de Henares in July- August 2017 this summer. Muchas gracias! Hi! What time does this tour start and where is the meeting place? I will be there first week of December on a week day. Thanks!! This is not an organized tour, is a list of the most interesting places in Alcalá so that you can visit them on your own. robbaker145@gmail.com . Thank you so much!!! Is one day is enough to explore Alcala?